Kowa Pharmaceuticals announced the results of a pre-specified safety analysis from the INTREPID trial that evaluated the effect of Livalo (pitavastatin) 4mg vs. pravastatin 40mg in HIV-infected adults with dyslipidemia following completion of the 40-week safety extension. INTREPID (HIV-infected patieNts and TREatment with PItavastatin vs. pravastatin for Dyslipidemia) was a Phase 4, multicenter, 12-week randomized superiority study that randomized 252 patients to receive once-daily Livalo 4mg or pravastatin 40mg. The study showed significantly greater LDL-C reduction for Livalo 4mg compared to pravastatin 40mg at Week 12. This also included a 40-week safety extension with secondary endpoints that compared the safety and lipid profiles at Week 52. At Week 52, safety profiles were maintained and consistent with Week 12 results with an overall incidence of treatment emergent adverse events (TEAEs) of 67.5% for pitavastatin (n=126) and 69.8% for pravastatin (n=126). Further, pitavastatin 4mg sustained more superior LDL-C reductions compared with pravastatin 40mg at Week 52 (-47.8mg/dL vs. -32.6mg/dL, respectively; LS mean % change -8.4, P<0.001). Separate post-hoc analysis data from the INTREPID study showed that >70% of patients had age as a risk factor and that pitavastatin 4mg showed significantly greater atherogenic lipid reductions vs. pravastatin 40mg in men >45 years old and women >55 years old. 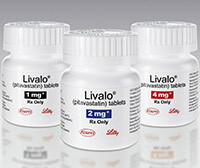 Livalo is an HMG-CoA reductase inhibitor approved as an adjunct to diet to reduce elevated total-C, LDL-C, ApoB, and TG, and to increase HDL-C in primary hyperlipidemia and mixed dyslipidemia. For more information call (877) 854-8256 or visit LivaloRx.com.